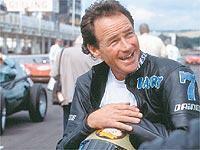 British legend Barry Sheene has been honoured in a special awards ceremony at the Phillip Island circuit today. As part of the 60th anniversary celebrations for the MotoGP world championship, special ‘MotoGP Champions Towers’ have been presented to some of the legendary previous winners during 2008. Today’s ceremony saw five-times world champion Mick Doohan, 2007 champ Casey Stoner, and 1987 world 500cc champion and former MCN Man of the Year winner Wayne Gardner collect their awards from Dorna boss Carmelo Ezpeleta. Late British star Sheene, who spent the majority of his time after retirement living and working in Australia where he became a popular figure, was also honoured at the ceremony. Modern day Aussie favourite Stoner, who relinquished his MotoGP crown to Rossi in Japan just five days ago, said: “Wayne was a bit before I could understand what GP racing was all about but even now I have the DVD of some of the great old races. My mum and dad had stocks of old tapes of the old races and it was something I grew up with for years. "Since I can remember, racing is all I’ve ever wanted to do after watching Mick come up and do what he did with the injuries and how he pushed through. Something that stuck with me was Mick and Wayne never giving up. I’ve had some hard years but I kept pushing all the time, even when things looked really grim for us.